A friend of mine was playing with designs for her website. 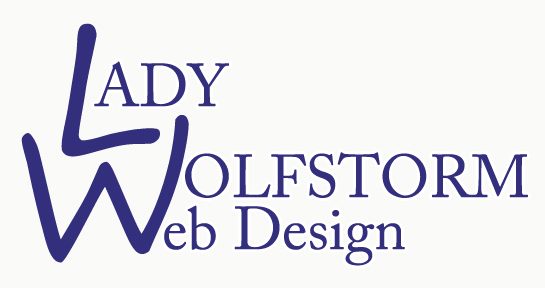 She’s considering the name Lady Wolfstorm Web Design. In the course of some suggestions I gave her on th ings she might try, I played with some fonts to come up with some text-based logo ideas. I thought I’d share them here. All these designs were done with free fonts available online and I did not manipulate them at all. I just made them different font sizes and arranged them in different positions in Photoshop. No warping or retouching. I’m hoping my friend, who does know her way around Photoshop, can create her own text logo that projects the exact image she wants to show. I wish her the best of luck with her design. I’m sure she’ll come up with something good.